First days. We’ve all lived them. Sometimes, we’ve just survived them. First days of a new school year. First days in a new town. First days of a new relationship. First days on a new job. Some look forward to first days — embracing the clean slate and fresh opportunities ahead. Others dread the unfamiliar territory, having to reorient, and laboriously recreate routines. Often in a pejorative sense, today’s culture coined the term “noob” (short for “newbie”, the “new person” in a group, team, or organization) to identify anyone living in whatever first days they are experiencing. 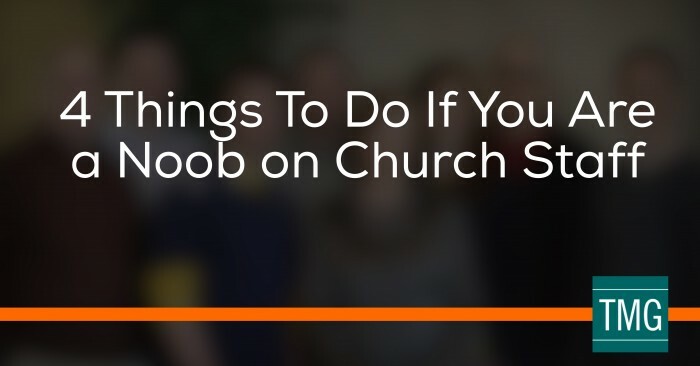 Regardless of your perspective, challenges are a part of any first days and you might be wondering what things to do if you are a noob on church staff. So, church leaders, how can you best live out your first days? To become a member of your new team, you likely went through an extensive interview process that made you familiar with the organization, some team members, and your expected role. But even the best interview and orientation processes barely scratch the surface of day-to-day interactions within the organization and the team’s culture. Before your first day, try to learn all you can about the organization’s mission, core values, vision, and overall approach to strategic planning…and where your team fits into those areas. Also learn as much as you can about your fellow team members. I call this “professional cyber-stalking.” Try to learn about the backgrounds of your teammates, from education and work experience to hobbies. This research helps you be able to hit the professional ground walking or running a little bit faster. 2) Observe, analyze, then act. In today’s fast-paced world, the act of observing is becoming a lost art. The patient practice of observation gets overwhelmed by layers of emails, calls, meetings, social media, and all the characteristics of our hectic personal and professional lives. Rediscover the art of observation. Look around at the setting in which you and your team work together. Do cubicles and walls lessen the opportunity for interaction? Does each person have their own piece of office territory? Are there areas to have team discussions? Are there formal conference rooms set up in the traditional hierarchical sense, or are there round tables that imply all voices are important? Notice how people are acting. Are they engaged? Thoughtful? Abrupt? Quiet? Listen to how each person speaks. Look at their body language. Channel your inner scientist and observe your heart out! Continue building your library of observations. Remember…if your mental or written observations simply sit and collect dust, then they are worthless. Instead, be intentional to reflect on a regular basis to see what insights may be gained. Such analysis transforms information points into application points. This should be an ongoing process for all teammates every day, regardless of title or time. Continuous learning characterizes high-performing teams and individuals. To the extent possible, spend as much time observing and analyzing before acting. As the adage goes: you can only make a first impression once. You can also be creative to learn about individuals and your team in a short amount of time. For example, I recently joined the established team of church vision consultants at the Malphurs Group (TMG). I was the newest of the newbies. And my first experience with TMG was a team meeting where consultants from all across the country gathered together in one physical location to envision the team’s future—a critical task for any church or other organization that is growing. The professional equivalent of baptism by fire. I was tasked with the opportunity to design an activity that not only allowed me to learn more about my new teammates, but also allowed our newly expanded team to build unity and momentum in a short amount of time. After the opening devotional and prayer, our CEO turned control of our first morning to me — simultaneously showing faith in me while also adding some pressure. The first activities of the first morning of multiple days of meetings can set a tone for the rest of the days. My charge—as the noob—was to handle introductions. I didn’t want this to be a traditional “the team listens to you talk about yourself” or the slightly better “the team listens to someone else talk about you.” I wanted to create a memorable experience engaging each type of learning (visual, auditory, and tactile) to reveal each individual’s personality, experiences, ways of thinking, and heart. If that occurred, learning everyone’s name would be a natural byproduct instead of the normal challenge for the noob. In Square #1, draw your favorite state. In Square #3, write out your favorite Bible verse. In square#4, write one characteristic of a successful team. I told them not to write their names on the squares and that they had a four minutes (1 minute per square) to finish, and I kindly updated them along the way of how much time remained. Then, I asked them all to tear their squares apart and create four piles of squares according to their number. Previously, I created labels for the respective square categories and taped one to a wall in each of the room’s corners. We then taped the corresponding squares under the categories. Having spent only five minutes to this point, I asked the team to huddle around the first corner and first observe. Over the next 40 minutes, we shared heartfelt explanations, shed tears, gained insights, created unity, and gained momentum. Square by square, we first shared a laugh about our artistic and geographical skills by trying to guess the state drawn. Then, the artist identified him/herself and gave a brief explanation for their choice. I would then write the name of each person on their respective square. We followed this pattern at each of the room’s corners. Responses in Square #2 ranged from silly and humorous to serious. Square #3 elicited spiritual perspective and insights, while Square #4 provided information that would be useful as our team grew over the next days. The results were tremendous! Not only did the noob learn everyone’s names, we all got a glimpse into each other’s hearts and minds. We dug deep past the superficial level and mined at the personal, emotional, professional, and spiritual parts within us. Everyone was heard, and I left the squares taped to the walls for the rest of our meetings. During breaks, I—the noob—along with the whole team could use them as a cue to create meaningful conversation. This approach may not be viable in your situation, but think outside the box to create opportunities to know your new teammates on deeper levels, create a sense of familiarity and unity, and generate forward momentum. High-performing teams are always looking to improve. Becoming comfortable breeds complacency, which hinders maximum performance. An infusion of new perspectives and personalities can instantaneously change a team’s dynamic. This change can be for better or for worse, but if you are valued enough to be asked to join the team, have the courage and confidence to speak up. Your insights may cause others to think in ways they previously never imagined, and the team will be better for it. This is what Liz Wiseman aptly calls “rookie smarts.” High-performing teams intentionally encourage noobs to speak up. This simultaneously challenges veteran team members and noobs alike, but in opposite ways. Veterans must be humble and noobs must be bold. Members of high performing teams, regardless of the role, rise to that challenge. Hopefully sooner than later, you will become enmeshed in the team’s DNA. As more of your strands are sewn into the organization, the emotional intensity of your days as the noob will naturally be tucked away in the recesses of your brain. The last suggestion for things to do if you’re a noob is to remember that when you’re no longer the noob to remember that were once a noob too. This will give you a sense of compassion and empathy when the next noob joins your team. Reliving your past will help your new teammate and your team re-envision the future…for the better. Tim Abraham is a Church Strategy and Leadership Consultant for TMG, and Co-Founder of Beyond Leading. He’s served as a member of the executive leadership team for a large church in West Virginia, in addition to serving within high levels of state government.